YLP is a brand I don't hear about too often, and I think they deserve some more attention - they make a lot of really innovative and interesting products. I reached out to them, and they agreed to send over the Sherp S15, which I'm reviewing today. This is a single 18650 light with a main forward-facing light, and a secondary diffused side emitter. The light has a magnetic tail, a stainless steel bezel, and is controlled by a single side switch. There's not a lot not to love about this light. Even without the secondary side emitter, which is the most notable feature of this light, it would still be an easy recommendation for me. It's compact, has a great UI, comes in a warm CCT by default, and the build is good. It also has a few features I like to see, like a stainless steel bezel and a strong magnetic tail. Adding in the side emitter, with a very soft even beam, just adds a bit more. Namely, this makes the magnetic tail doubly useful, as a right angle work light. The LEDs aren't what I would have gone with were I in charge of the design, and I didn't love the way charging worked- but overall, this is a great light with a good design. I measured the light at 111.5 mm long and 25.3 mm wide at the head. The cell tube of the light is a bit slimmer, measuring 22.8 mm in diameter. The light weights in at 63 g, or 110 g with the included cell. The light is a bit shorter than the Convoy S2+ I like to use for size comparisons. It's surprisingly compact, and much smaller than the rotating head designs I have tried that aim for a similar goal. At the head of the light, the TIR is held in place with a stainless steel ring. There are a few fins on the head for heat dissipation. Behind those, one side has a small orange button with a stainless steel ring around it. Opposite the switch is the secondary flood emitter. The diffuser is slightly domed, but it's set back into the body so it won't get scuffed on a flat surface. The cell tube is not knurled, but has three wide grooves cut along it's length. The fourth side, aligned with the switch, is bare. The center groove has the model and brand etched into the coating. The tailcap is flat, with some notches for grip and a lanyard hole. The flat base means the light has no issues tail-standing. Inside the tail, there's a gold colored spring that holds the magnet in place. Interestingly enough, the magnet is ring shaped instead of circular - perhaps to better allow removal without any extra parts. The threads on the tail are square cut and anodized, meaning the light can be locked out with a slight twist to prevent accidental activation. The body tube seems to be thread-locked to the head, but there's a surprisingly long spring to be found at the head end of it. I measured a full 9 mm of travel on the spring. This is a standard tube-style 18650 light, so there's not much to say about ergonomics. I will say that the small button can be difficult to locate by feel, especially with the domed side light directly across. The pocket clip has a good profile, but it does protrude slightly from the body where it connects, which is a bit of a pet peeve of mine. I find this common flaw catches when sliding over fabric. The clip is not especially deep, and leaves a little over 2 cm sticking out of a pocket when used. The clip can be reversed, but seems designed for head up carry. The light also has a strong magnet in the tail, capable of holding the light in any orientation. 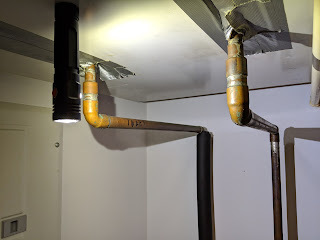 I love magnetic tails in mid-sized lights like this, and it becomes even more valuable with the two light sources this tool has. 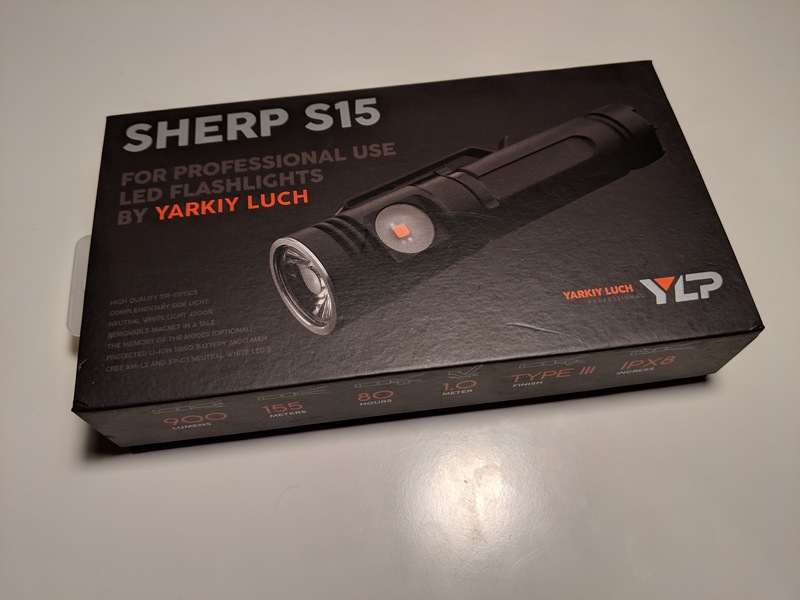 A headband is not included, but a picture on the YLP website shows that this light can be used as a headlamp with the side-oriented secondary emitter. That's an interesting option for sure, but the extremely floody nature means that this will only be useful at very short distances. On a light with two separate emitters, there's a lot of opportunity to mess something up in terms of the interface. I'm happy to say that YLP did a fantastic job here, and the interface is extremely intuitive. Shortcuts to moonlight and turbo, mode memory, and single press for off, even with the addition of a secondary emitter. Great UI! 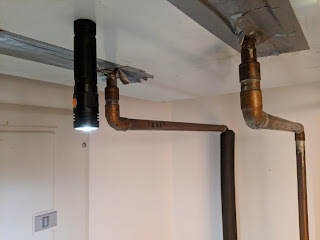 The forward-facing main light uses an XM-L2 behind a TIR. The TIR is interesting - it's mostly smoothed, but the very center is dimpled. It's a warm white emitter, and the optic chosen gives it a fairly tight hotspot and an even spill. The XM-L2 isn't known for it's tint, however, and picky users may notice it's a bit greenish. Overall, this is a balanced beam with a good amount of reach for a light this size. The side emitter is an XP-G3, also warm white, and behind a diffusing window. I don't believe this does much to focus the beam - it seems to be almost a mule, with the plastic serving mainly to protect the LED and smooth out the beam. There is some tint shift that will be noticeable to people looking for it. The light runs off of a single 18650, and ships with a YLP SA1826R cell with built in micro-USB charging. The cell advertises a 2600 mAh capacity, and was used for testing. The springs at each end of the cell tube had no problem making contact with a shorter unprotected flat top cell. As this is an e-switch light, there will be some drain on the cell in standby. I measured this at 0.05 mA, which is for all intents and purposes completely negligible. Testing with the included cell, the light on turbo stepped down quickly to about 70%, and slowly tracked the voltage downwards. Runtime to 10% was just under two hours. Running on high, the output was far more stable, and stretched a bit past the two hours mark. In both instances, the advertised times were exceeded. 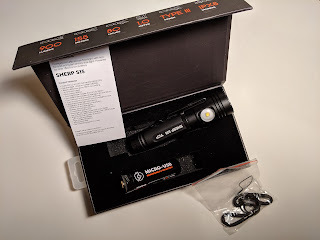 The side LED was also tested on high with the included cell. This was mostly stable for the duration of the test, and ran out after a bit longer than 5 hours, falling just short of the 6 hours stated by the manufacturer. It's likely that a higher capacity cell would have easily met the stated duration. 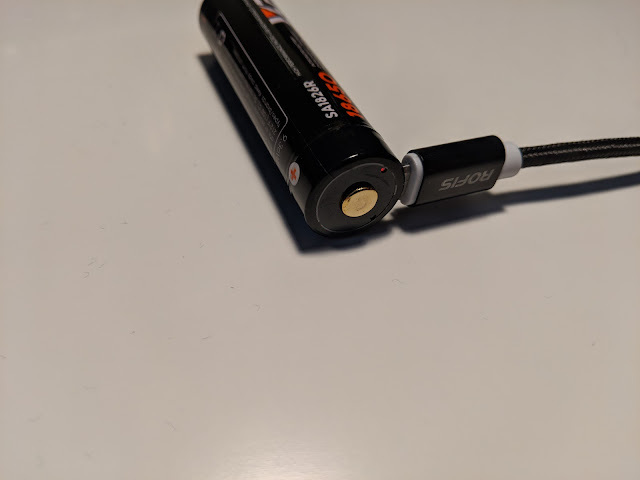 To charge the cell, a micro-USB cable is plugged directly into it near the positive end. There's a small red indicating LED that lights up when charging, and a separate green one that switches on when the charge is complete. 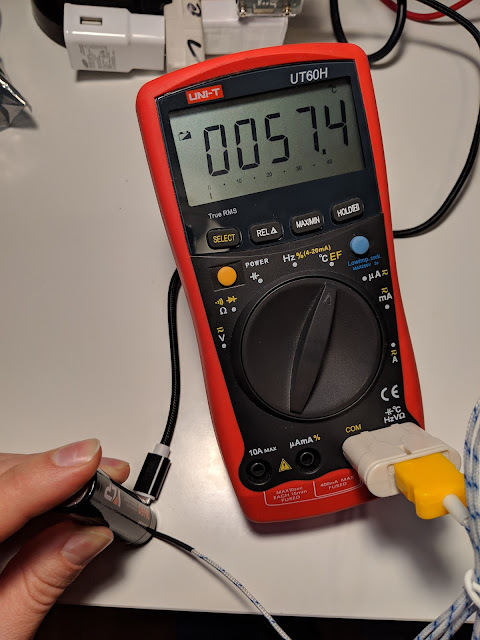 The charge current was measured from the USB source. It seems to charge at a (relatively) constant current of around 0.75 A, before entering a short C-V phase. The charge cut off at 0.05 A and did not trickle charge afterwards. The spikes in the current were caused by me taking temperature measurements - I noticed the positive terminal got quite hot during this charge. I measured the temperature at 57° C. This isn't hot enough to cause any damage to the cell or to be concerning, but I would be more comfortable if it were able to keep a bit cooler. Interestingly, the current spikes observed when temperature measurements were taken seem to indicate that the charge rate is thermally regulated, and the heat sinking into the thermocouple caused the current to increase.